Space scientists around the world view the universe through our instruments. 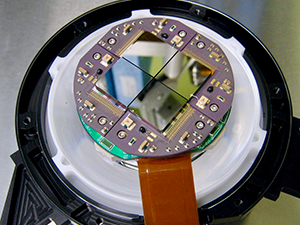 We make detectors and other scientific instruments, electronics packages, and entire payloads that supply groundbreaking data and withstand the rigors of spaceflight. Right now, instruments designed and built at SSL are flying toward the sun on the Parker Solar Probe, where they will be put to the ultimate test: surviving conditions closer to the sun than any spacecraft has ever flown before. 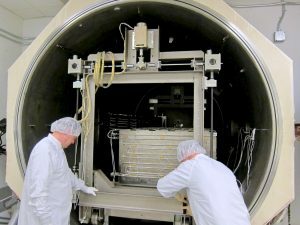 SSL facilities (complete with a mission control room, a ground station with 11-meter dish, several cleanrooms, a fabrication shop, extensive environmental testing facilities, and a high bay measuring 60 feet tall) accommodate researchers with highly-specialized needs for their experiments. Our capabilities include in-house instrument design from concept through launch, including fabrication, testing, stringent quality assurance, integration onto the spacecraft, and launch support. Post launch, we handle mission operations—including flight dynamics, commanding the spacecraft, and bringing the data down to SSL’s own ground station—as well as data processing and analysis. Instruments have been built at SSL to fly on more than 100 satellites. In addition, more than 150 balloons have been flown to measure electric fields, auroral x-rays, hard x-rays and gamma rays, cosmic rays and the cosmic microwave background. And more than two dozen rockets have been built and flown to measure auroral particles, UV emissions, and solar flare nuclei.